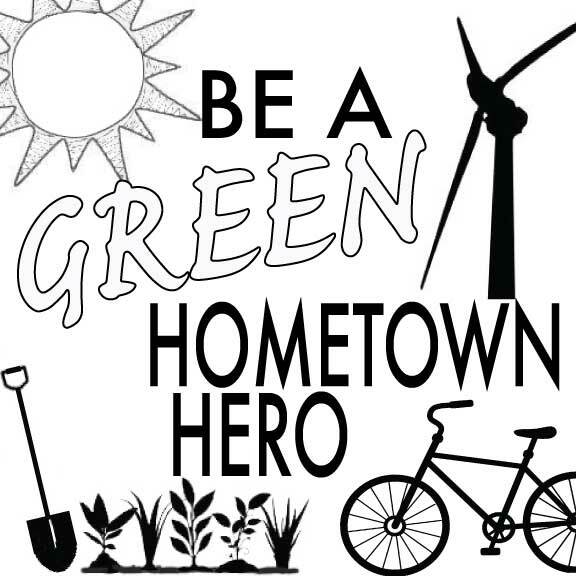 We are writing today in celebration of the many heroes in our hometown who are working hard to raise and promote sustainable local food, bring renewable energy to our community, reduce the waste being entombed in our landfills, and protect our air, water, and land. And we also want to cheer the efforts of the unsung heroes: regular people who are doing their part to help our planet and public health by doing things like growing a garden, using less and recycling more, choosing products with less chemicals, driving less and turning out the lights. Every year the Granville Kiwanis put on a wonderful Independence Day festival with a parade on July 4 down the main street of the village. Crowds of people young and old come from all over the county, lining the streets and cheering for marching bands and baton twirlers and floats made by local groups, neighborhood associations, and businesses. It’s like a scene from a movie about small-town Americana. We love that our town keeps this tradition alive. This is the second year that our business, The Going Green Store, will sponsor a float for the parade with a “green” theme. Last year we sent out a call for participation and were joined by 32 organizations in our county who are doing their part in one way or another to help the planet. It was an amazing experience to bring together so many like-minded organizations and it helped us all see our individual efforts in a more connected way. This year the parade theme is “Hometown Heroes”. It reminds us of the World War II posters that called on local people to do their part to contribute to the war effort by raising Victory Gardens, recycling and reducing their use of precious materials, and conserving resources. Through the simple messages on those posters, people gained awareness about how their small efforts at home made a difference to battles fought in distant lands that had an impact on everyone. In the modern world our battles are different, but small efforts by many people are needed more than ever to make a difference. Today some of the greatest threats we face as a country relate to our health, supported by the mounting evidence that how we treat the planet ultimately affects us -- the humans in the eco-system. This is about the widespread use of chemicals in many common products and our industrialized food system, and the uncertainty about how things like antibiotics, growth hormones, pesticides, and genetically modified crops may be affecting our health in ways we don’t fully understand. Many people who study big-picture threats are sounding the alarm about the dying bee populations, and that’s the stuff of nightmares. Let alone the risks to our water and air from things like gas and oil drilling and other industrial processes, and the implications if we don’t get an effective alternative energy system up and running soon -- regardless of whether you “believe” in global warming. And it all comes back to human health, and what the lives of our families and children will look like if we don’t solve these problems, which makes this very personal for all of us. These are big problems. Facing them can make us all feel a little overwhelmed. Waiting for the government or some corporation to provide a solution is unlikely to get us where we need to be. Signing a petition or writing a check to a nonprofit that’s doing the work you care about is easy, but it’s also not enough. Our only hope to make a real difference is for each of us to take concrete action on a daily basis. Just like the people who helped the war effort by making a difference on the home front, some of our modern heroes are the people who are doing what they can for the common good, through the little choices they make each day. Sometimes these daily choices are hard to make -- they might take an extra effort, cost a little more, or require us to create new habits. Occasionally we have to undertake these small actions in the face of naysayers, or even outright opposition, when people with entrenched interests simply refuse to believe that we can make a difference. Our heroes are all the people who carry on doing what they can do to protect the planet, even when it's not easy. This 4th of July, we can all be a Hometown Hero in our communities. We all need to make the best choices we can make to protect our health and the planet, every day. We can think about the products we buy -- how they were made, how far they traveled to get to us, what goes into the waste stream when we are finished with them. We must support the local farmers who raise wholesome food close to home, and the small businesses who are doing what they can to green their operations. We can think about how we use our planet’s non-renewable resources every day. And we must stand together and encourage others to join us: do what you can to live green, start with the easy stuff.